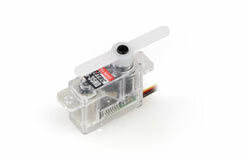 All Products > "2212030 HiTec HS35HD Ultra Nano Servo"
Never before has a servo so small delivered so big. The HS-35HD Ultra Nano servo offers unprecedented durability thanks to our exclusive Metal-Karbonite gear train. Delivering maximum performance at minimum weight, the HS-35HD is destined to become an industry favorite. Its long life and uniquely engineered gear train will make it one of the most reliable and efficient tiny servos on the market. The HS-35HD is perfect for micro 3D and sport aircraft as well as many small helicopters. Torque: 0.8 / 1.0 kg./cm.